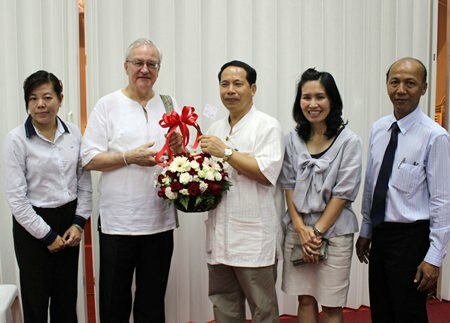 Peter Schnyder, General Manager of the Imperial Mae Ping Hotel and the management team recently congratulated Phumkanok Ariyanana, Managing Director of Pantip Plaza, Chiang Mai on the occasion of the 10th Anniversary of Pantip Plaza. General Manager of the Shangri La Hotel Chiang Mai Franz Richter welcomed the Ambassador of India to the Kingdom of Thailand H.E. 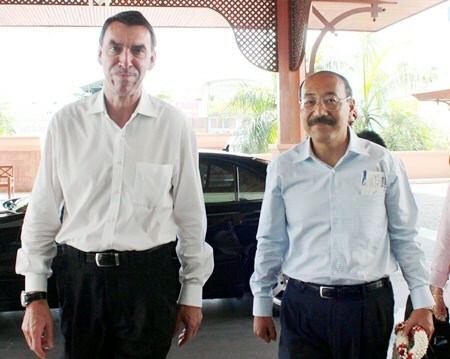 Harsh Vandhan Shringla on his stay at the hotel recently as the Ambassador paid an official visit to Chiang Mai and met with local members of the Indian community. On Wednesday May 21st, K. Fon of Baan Rim Naam on ChangKlan Rd. celebrated her restaurant’s five-year anniversary with the help of special guest star Tukky, beloved Thai comedienne. She appeared on stage with her ladyboy background dancers and delighted the audience with 2 hours of songs, some performed from among the audience, allowing nearly all to get a selfie with her. Baan Rim Naam features Thai and Northern Thai dishes, and live music nightly. K. Fon (center) is seen here on stage with Tukky (far right). Charter President of the Zonta Club of Chiang Mai Z. Somboon Suprasert (left) and President Elect Z. Suwimol Limlenglert (2nd right) gave a gift to past President Raya Luela (2nd left) on the occasion of the end of her term in office as Zonta Club Chiang Mai President for 2012- 2014 at the Jia Thong Heng Chinese Restaurant Chiang Mai on May 15, 2014. Robinson Department Store donated clothes and appliances to the Chiang Mai Provincial Red Cross Chapter for use in charitable activities held by the Red Cross. Here Setthawut Tassoora (4th left), General Manager of Robinson Department Store, Chiang Mai and administrators give the donations to Angkana Phuthiwinyoo (4th right), President of Chiang Mai Provincial Red Cross Chapter and committee on May 15, 2014. 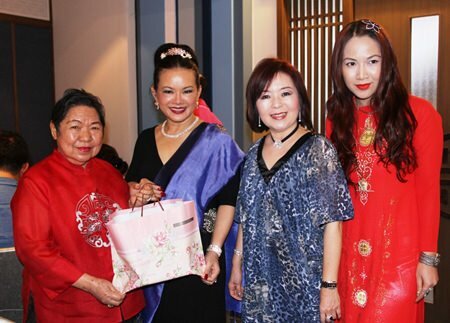 Khunying Suchitra Mongkolkiti Chirathivat, Honorary Advisor of the Board Committee, Central Plaza Hotel Public Company Limited celebrated her birthday with friends and family at the Sunflower Chinese Restaurant on the 24th floor of the Centara Duangtawan Hotel, Chiang Mai recently when she came to the city to make merit on her birthday. 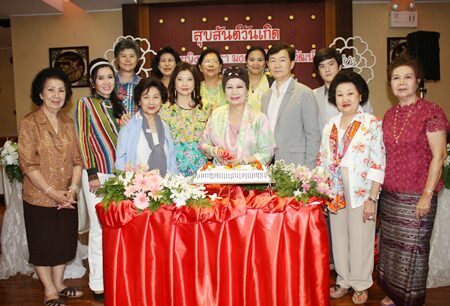 She is seen here cutting the cake with friends and family; Mukda Auywattanasakul, Rattana Noraphunlop, and Aphatsara Hongsakul. H.E. 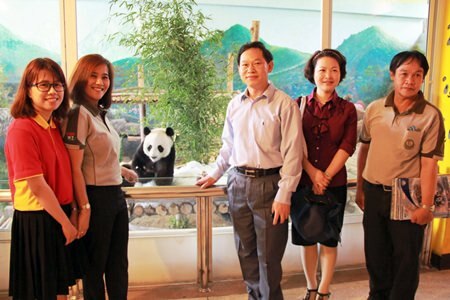 Chao Xiaoliang (3rd right), the Chinese Consul – General in Chiang Mai and his wife (2nd right) were welcomed by Wittaya Saenkham, head of the PR Department of the Chiang Mai Zoo to the Chiang Mai Zoo on May 12, 2014. The couple, newly arrived in Chiang Mai, paid a visit to the panda couple Chuang Chuang and Lin Hui, goodwill ambassadors of China. 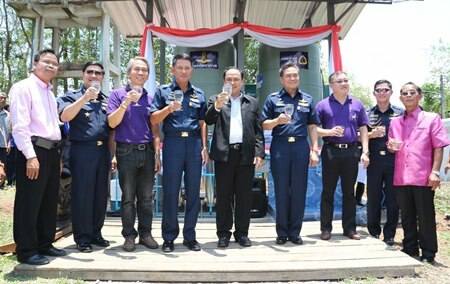 Air Marshall Taworn Maneepluek, Deputy Chief of Staff for Civil Affairs, Royal Thai Air Force and his team visited Wat Mueang Mae Len in Mae On District, Chiang Mai on May 8, 2014 to meet with drought victims in Mae On who had been helped by the water filter tanks donated by the Royal Thai Air Force and Siam Commercial Bank. 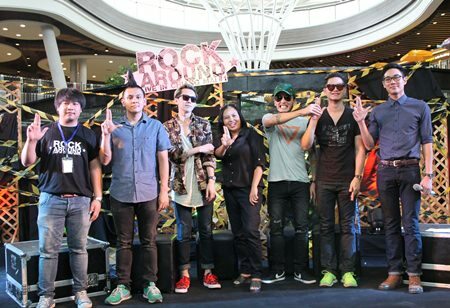 Members of such famous bands joined Promenada Resort Shopping Mall staff on stage at the Promenada Resort Mall on May 18, 2014 to announce the upcoming Rock around Live in Chiang Mai which will be held on June 22, 2014 at the Chiang Mai University Convention Center on Nimmanhaemin road. Popular bands including Paradox, Potato, Lomosonic and Boom Boom Cash will be performing in the festival.